OKLAHOMA CITY, Okla. — Atop your roof are up to half-a-dozen vent pipes, each one open to rain, dust, debris, insects, birds, and nocturnal animals, but a new inexpensive product has arrived to provide protection. It’s the E-Cap from JAF Industries. “For less than $10, homeowners can get safe, effective, environmentally sound protection with an E-Cap,” states Kenneth Brown, president of JAF. Consumers are learning about E-Caps through a video airing on YouTube and the JAF Industries site (http://www.FitTheWonderCap.com). All information about the E-Cap can be read or downloaded from the site and individual or bulk orders may be placed there as well. PickedonPipe. – A PVC eCap cap vent for roof or side vent pipes. 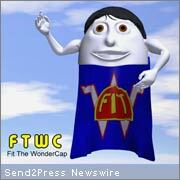 JAF Industries is also offering a unique interview opportunity: Web sites, magazines or newspapers can feature an interview with Fit the Wonder Cap. Fit will even reply to home repair questions from readers. To set up your interview with Fit, contact Kenneth Brown at JAF Industries, 405-606-1008.